WHO: Media can tour the exhibit with Earle Havens, Nancy H. Hall Curator of Rare Books and Manuscripts, Johns Hopkins University’s Sheridan Libraries. BACKGROUND: This is the first major exhibition to showcase some of the rarest and most spectacular treasures of the George Peabody Library, which was founded in 1857 by Baltimore tycoon George Peabody. Many of the extraordinary exhibit items will be on display to the public for the first time. The exhibition highlights Peabody’s ambitious plans at the dawn of the Civil War to create a neutral cultural space for books, learning, and the arts in a divided southern city. Bibliomania includes a copy of the library’s 1863 “desiderata” or wish list, printed in over 200 pages and circulated around the world with the goal of building a great library for the ages with 50,000 books. Another highlight is a medieval manuscript of Aristotle’s scientific works that was tossed from a window of the burning Baltimore Athenaeum in 1835 and later recovered from a street gutter. 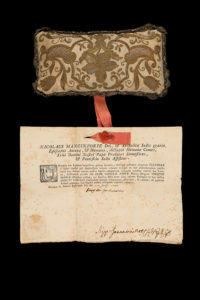 Still another amazing item is a reliquary pillow authenticated as having borne the foot of St. Anne, the mother of Mary and grandmother of Jesus. The exhibition runs from September 22 through January 31, 2018. A public opening event will be held Sunday, October 1, with a reception at 3 p.m. and remarks at 4 p.m.
Members of the media who expect to attend the press preview should RSVP to Jill Rosen at 443-997-9906 or 443-547-8805 or jrosen@jhu.edu.